WASHINGTON — The U.S. Air Force's decision to shut down a key component of its Space Surveillance Network will weaken the service's ability to accurately detect and characterize objects in Earth orbit, experts say. "The Space Fence does a lot of heavy lifting," said Dave Baiocchi, a senior engineer at the Rand Corp., an Air Force think tank in Santa Monica, Calif. Without it, "you're missing some level of accuracy," he said. "This is your notice to begin preparing the sites for closure," the memo said. "A specific list of action items will be provided as soon as it is finalized." In an email Aug. 5 Andy Roake, a spokesman for Air Force Space Command, pointed to the automatic budget cuts known as sequestration. "In this tough, sequestered budget environment, we're considering many options, but for FY14, no final decisions have been made," he said. "The Space Fence is very important as it gives an 'uncued tracking' capability," Weeden said. "Because it's constantly transmitting, it can detect objects without being tasked to do so. There are some other sensors in the network that can do uncued tracking to some degree, but the Space Fence is rather unique in the sheer size of the detection coverage it has." "It will be more difficult and take longer to detect and catalog new pieces of debris, especially those from large breakups," Weeden said. 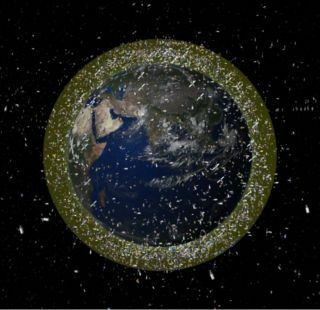 "And the loss of capacity likely means that we have less accurate orbits for a good portion of the space debris" in low Earth Orbit, he said. In April, Shelton said two of the Space Fence's receiver sites had been placed in cold storage, one in Glennville, Ga., and one in Hollandale, Miss., reducing the overall accuracy and effectiveness of the system. The change was made as part of the Air Force's response sequestration, the across-the board-budget cuts that took effect in March. In July, the Air Force released a request for proposals to operate the aging system beginning in September 2015 — one year after the Five Rivers Services' contract was set to expire. The request said the Space Fence "has been identified as a critical defense system and, therefore, shall be manned on a 24-hour, 7-days-a-week, 365-days-a-year basis at transmitter sites and 8-hour, 7-days-a-week, 365-days-a-year basis at receiver sites." "Closing them down would have impacted those other missions and likely generated a lot more political heat from Congress," Weeden said. Meanwhile, an overdue contract to build a next-generation Space Fence is on hold due to the Defense Department's recently completed Strategic Choices and Management Review, which examined the Pentagon's options under three different funding scenarios for the next decade. See the Air Force's memo about the Space Fence shutdown obtained by SpaceNews.